Special Clamps For Installing Cabinets-This image is from our review article on the Pony Claw Clamps. 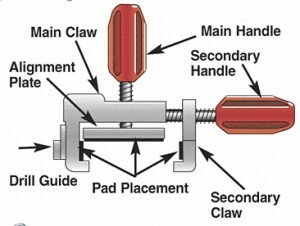 These clamps were designed specifically for installing cabinets. Just click here: Pony Cabinet Claw Clamp Review to watch the video demonstration of how the special cupboard installation tool works. These specialty clamps are not exactly cheap, but I feel are well worth the investment for anyone seeking to obtain professional results when installing cabinets.